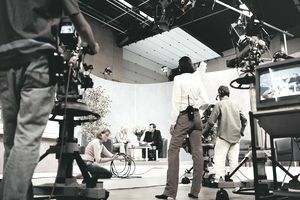 The production assistant or PA position is an entry-level opening on a film or television set. The production assistant does just about anything and everything, from getting coffee to making script copies to shuttling crew or equipment around town as necessary. How much a production assistant does depends on the budget of the production, as well as how much faith his superiors have in his abilities. The PA position involves a lot of grunt work but it can really be a learning experience. It's a highly visible position in that just about anyone can give you an order or ask you to do something, from the producer to a sound technician. The production assistants who do as they're told without complaint are the ones who are remembered when it comes time to fill more important positions. Although no particular educational background is necessary to be an effective production assistant, it's crucial that you possess the following traits and skills. Be a good listener: No one likes to have to repeat themselves, so be on your toes at all times and listen intently to whatever directions you're given. Be responsible: Production assistants are extremely easy to replace. You won't be there long if you're late, lazy, or hard to manage. Be willing to learn: Do all you can to learn as much as you can about every job on the set without getting in the way or becoming an obstacle. Be patient: If you're good at what you do, someone will notice. You'll be required to think on your feet and you'll have to be able to do so at a moment's notice. Producer Kathleen Kennedy started out as a production assistant on the Steven Spielberg movie 1941. She was asked to help him organize a number of special effects notes he had in various states of disarray. Some were on cocktail napkins and others were on half sheets of paper. She took the notes home with her and organized and bound them into separate notebooks. This so impressed Spielberg that he took her under his wing and eventually helped her to become one of the most powerful female producers in Hollywood. Another name for a production assistant is "gopher," as in you'll "go-for-this" or "go-for-that." The best production assistants and the ones who are typically promoted out of the PA position sooner rather than later are those who simply don't know the meaning of the word "no." They never say, "I can't." The more you do as you're told, the faster you will rise. But that doesn't mean you should be a robot. Creative thinking is also an excellent asset to have as a PA. If you have a bit of an ego about letting other people direct your actions, either leave it at the door or find another line of work. The production assistant position is one that takes a lot of emotional abuse from a number of different departments but do as you're told and learn as much as you can from anyone willing to teach you. After a while, you just might find yourself with a promotion and your production assistant.